This book is a sequel to The Monk Who Sold His Ferrari, and explains how to boost workplace productivity, and initiate personal change. Robin Sharma, the well known personality development expert, teaches his life lessons in the form of stories. He creates a fictional person who faces a crisis and then teaches leadership principles through the lessons learnt by that person from his mentors. In this book, the story revolves around Peter Franklin, an entrepreneur. His software firm is struggling to survive, and he can see no way out. Just as he is about to throw up his hands and give up on everything, an old friend appears. It is the fast living lawyer, Julian Mantle, who became a monk in The Monk Who Sold His Ferrari. He slowly teaches Peter how to get out of his situation. He teaches Peter how to turn his company into a good place for his workers, and then increase productivity. Mantle teaches Peter that unless his workers are feeling good about their work, have job security, and derive job satisfaction, there will not be much efficiency in their work, and no loyalty. He teaches Peter how to touch people’s lives in a positive way, how to gain their confidence and loyalty, how to create team focus and unity, how to increase profitability and efficiency, how to inspire and develop the team, how to be creative and innovative under pressure, and how to effectively bring about personal change. This book teaches the reader how to boost morale in the workplace, inspire loyalty, increase productivity, and also bring about personal change to lead a happy and contented life. Robin Sharma is ranked among the top leadership experts in the world. 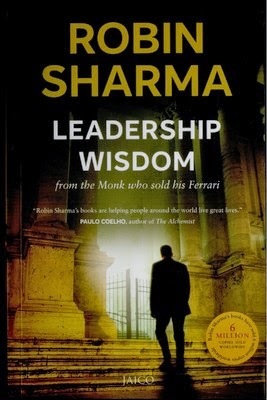 Other books by Robin Sharma are The Leader Who Had No Title, The Greatness Guide, The Monk Who Sold His Ferrari, Discover Your Destiny With The Monk Who Sold His Ferrari, and The Saint The Surfer And The CEO. All his books are about self-improvement and leadership skills. Robin Sharma was born in 1965 and holds two law degrees from Dalhousie Law School in Halifax, Canada. He is a former litigation lawyer who quit his practice to write books on self development and leadership. He self published his first book, which was edited by his mother. His second book, The Monk Who Sold His Ferrari was picked up by HarperCollins and became a huge international bestseller. Robin Sharma established Sharma Leadership International, a consultancy that helps people in the corporate world enhance their leadership skills.